February – the month with only 28 days often feels like it’s the longest month on the calendar. Here in Pennsylvania, winter cold got started ‘early’ this year with bone chilling, freezing days. Not that we’ve been complaining about the weather (but we have) because it’s winter in Pennsylvania. Then we have those famous groundhog prognosticators of future weather. They all agreed (at least the more well-known) that we would have 6 more weeks of winter. This decree being given on February 2 — with the first day of spring about 6 1/2 weeks away. So we watch for other important signs of the spring-to-come — daffodils and other early spring bulbs poking thru the ground, flowers budding on witch hazel and quince bushes; those precious extra minutes of daylight after 5 pm; late winter snowfalls that disappear from the ground in a day or two due to the bright, warm sunshine; and of course – robins who arrive and feast on holly berries while they wait for insects and worms to wake up. February is our anniversary month – 15 years since we first opened in the mall with a very limited amount of stock. We were asked a few times those first couple weeks if we were closing, the space looked so empty. And now, 15 years and one BIG move later, we are still around. Happy to be doing what we are and keeping caught up with folks we’ve known for those 15 years. In appreciation, we like to throw a little party during our anniversary month to let you all know how important you — our customers and supporters have been to us. So February 22 – 25, Thursday thru Sunday we are going to celebrate and you are invited to join us. We will have cake and coffee/tea/water; some gifts with purchase (while they last); you’ll receive an added $20 on your rewards card with any (one time) purchase; and, instead of dip sampling — the CHC Dip Mixes that we all love will be specially priced just for the weekend! As we’ve done in the past, we ask you to bring nonperishable, nutritious, kid-approved food items in sin gle serve portions that we will collect over the next several weeks to deliver to Ruth’s Harvest. This backpack program provides weekend meals and snacks to eligible Hanover School District elementary school children. Bring in a bag full of food and we will give you $5 off your same day purchase of $25 or more during our open house. You are always very generous and we thank you in advance! And lastly, our Anniversary Open House gives us an opportunity to show off our new spring treasures! Lots of ‘galvanized tin’ that fits in with Country, Farmhouse and Contemporary decor; spring framed prints, florals, greens, garden flags and so much more. We do hope to see you for this special event! Hardly seems like Christmas 2017 is upon us. One day that we’ve been planning for – shopping for, decorating for, baking for, stressing over. Not much activity here recently — ’tis a busy season for us in retail – trying to manage with all of the above plus working long hours during this busy season. Even though this busy season is great for business – we try to remember that ‘. . . tangible gifts don’t make a Christmas great — love does’ (Tracie Miles, Proverbs 31 Ministries). Remember to spread some goodwill, cheer and especially love thru this wonderous Christmas season! Merry Christmas! We traditionally wait till the very end of October to bring out our wintry mix of gifts and home decor. 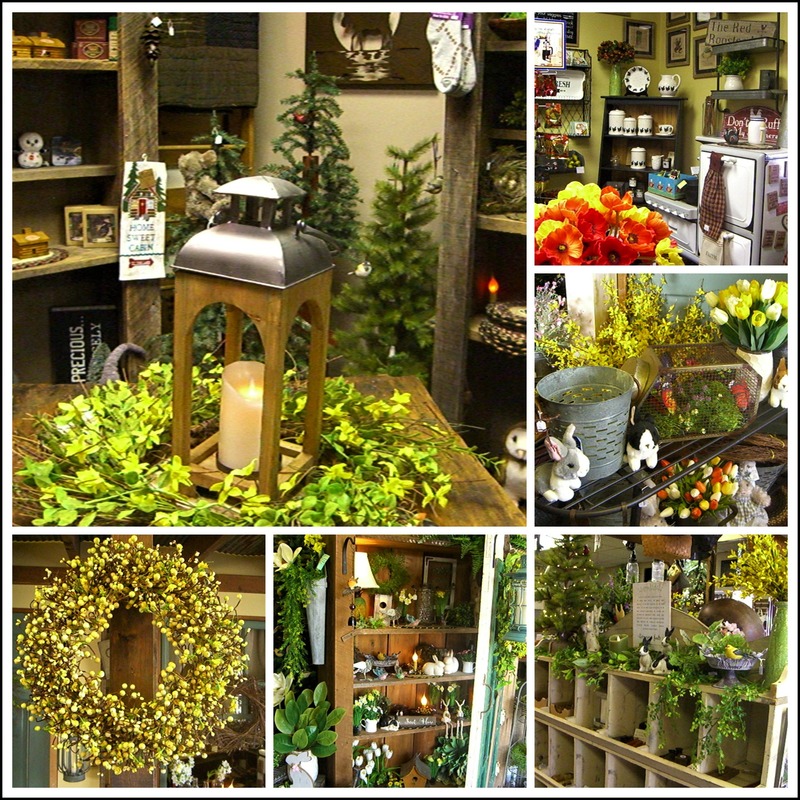 So, just in the last week, we’ve been getting ready for our Holiday Preview Open House November 9 thru 12. Love the warm, cozy look and scents of country and lodge decor? This year, we have lots of greens that you can use throughout the whole season – very realistic looking that compliment all decorating styles. Stop in to check out our progress – or plan on coming by during our Open House. Bring along your wish list and we’ll help you check it off! Check out our Facebook page for up-to-date info and photos. Give us a call for directions! Help us clear our shelves to make room for our wintry merchandise. After this weekend, our Jack’O Lanterns and scarecrows will disappear into storage till next year. We’d rather see them find a good home to beautify! We know you may need some fallish things for your Thanksgiving holiday – for gifts or your own decor. We always keep an area with florals, turkeys and the like thru that special Holiday. And – if you see something here and live at a distance, give us a call and if it’s still in stock or available to order, we can arrange to ship to you! and for Ruth’s Harvest Backpack Program*. Be generous and bring a whole bag or box of food – and receive a $5 coupon to use on a purchase of $25 or more during our Open House Weekend! *Ruth’s Harvest needs single serving (kid friendly) non-perishable items to send home in small backpacks for the weekend for participating children. You may already know that here at A Bit of Country, we’ve had a Customer Rewards Program for over 6 years. When you sign up with us, and include your birthday info – we’ll send you a card during your birthday month to use for 20% off any one item! We love to reward our fans, so we’ve added another bonus to the program! At the end of each month, we’ll pull one name out of all the returned birthday cards to win a $20 gift certificate to use right here in the shop . . . starting now, this month! Ways to make sure you get your birthday card when the time comes . . . shop with us at least once in the past year . . . if you move, let us know your change-of-address. . . watch for your card in the mail the beginning of your birthday month. You can belong to our Customer Rewards Program and Birthday Club even if you live at a distance! When we ship your purchase to you, we’ll add it to your card on file and we can mail your birthday card for your discount during your birthday month. Our thank you to our great fans!